Midsummer 2007. Rhianna’s ‘Umbrella’ dominated the charts, the rained it rained every day (as forecast by Shakespeare), half of Britain was only accessible by submarine and the other half was overrun by ducks. Luckily The Pantaloons were well prepared for the Wettest Summer Ever as some bright spark suggested that umbrellas could be used to represent trees in the show. In practice they proved just as useful when they were used to represent umbrellas. But there was much more to the Dream than personal anti-weather devices (this is an umbrella term). The Pantaloons provided extra layers of theatricality by performing the entire play as their “rude mechanical” personas. Which turned the play-within-a-play at the end of the show into a play-within-a-play-within-a-play. And then, after the show was over, the cast apologised to the audience and explained that they had only been pretending to be the mechanicals all along. This of course made everyone realise that the play-within-a-play-within-a-play was actually a play-within-a-play-within-a-play-within-a-play. Confused? So am I. But it all made perfect sense at the time. Other highlights of the show included an argument about which male member of the cast would have to play Titania, a power ballad entitled “I’m The Biggest Bottom”, the front row of the audience pretending to be scary shrubs and possibly the most ridiculous fight between Lysander and Demetrius ever to disgrace the stage. 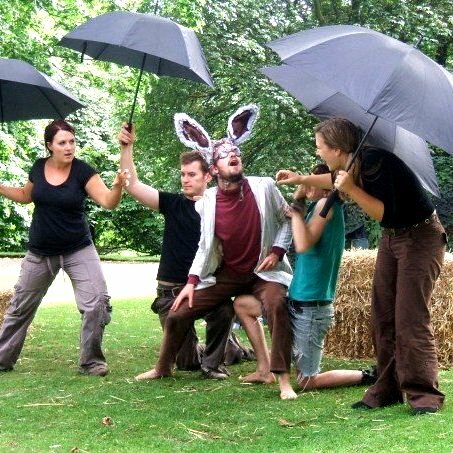 Yes, The Pantaloons’ production of A Midsummer Night’s Dream was absolutely umbrelliant! Sorry.